I will be updating the OP as often as I can to make this a one-stop source for the GWJ community. 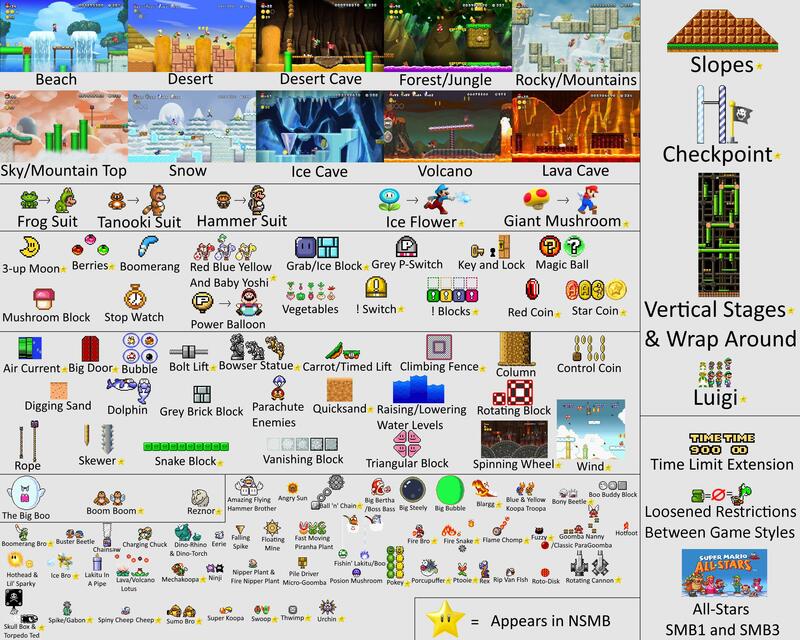 What's not in Mario Maker? This infographic lays it out for you. You can see the list of people you are following by going to Makers in Course World, and then switching to the Followed (or Following, I forget which) tab. Then just tap the person's listing, and all their courses will be listed out for you to browse and play! Dec 23, '15 Update: If the person's name is a link, it takes you directly to their Super Mario Maker profile page on Nintendo's site to browse and bookmark their courses. ClockworkHouse - B703-0000-004E-301E - MiiVerse: "A"
Farscry - A3C3-0000-00EF-BC38 - MiiVerse: "Farscry"
MakerWorlds - I saw this one linked from Reddit and emailed them about joining in to help out; I like the concept they're working from and hopefully this will be a solid resource for the community! MarioMaker subReddit - I'm not a heavy Reddit user, but I've been monitoring this subreddit for the last few weeks and it has some good resources. Something new I learned reading up on this, is that not only will levels have a player rating for how much they liked a given level, but the Difficulty Rating that each level has will not be determined by the author. Rather, the difficulty will be determined by an algorithm that ranks difficulty based upon how many people die/fail while playing that stage. That's an interesting idea and is a real positive mark for this one in my book. I imagine this means that some levels will go through some sort of trial period where they're unranked? Yup, seems there's an "Up and Coming" category when browsing for levels, and I suspect there'll be a "new and unranked" or something like that. I was concerned about "difficulty trolling", but fortunately it appears that won't be much of an issue, if at all. I'd be kinda interested to see what that algorithm makes of the first few levels of the different Nintendo-made Mario games. Have they gotten easier, or have we just gotten used to them? Since it makes the ranking based on player success, I suspect they would get rated as less difficult than they original were, since the majority of the players of this game have probably played those earlier levels enough to gain familiarity and thus there would be a smaller proportion of the player base dying/failing those levels. Adding to the many overt Mario Paint references, they're bringing back Fly Swatter which is one of the best time wasters ever invented. Why is THAT the one addition that makes this an unquestionable purchase for me? Because Nintendo is like some kind of crazy super villain. It knows how to get all of us, eventually. It's a really long game they're playing. But it works, that's for sure. Making this available early to streamers and reviewers and letting them talk about it has been a smart move. I've already seen videos for Metroid-style games, Flappy Bird clones, and an assortment of interesting level ideas. It seems like the engine here is flexible enough to do some pretty cool stuff. And people say Nintendo doesn't get streaming. Didn't the same thing happen with Mario Kart and Splatoon? I'm not watching anything!!! Cause I can't wait already!!! Well f*cking bully for streamers. Yes, I'm slightly bitter. And jealous. And annoyed that the online selection of levels is already going to be piled high with crap before I get the chance to start trying to publish my own. But meh, it's not like I'm going to get fame or riches from publishing Mario levels. I just want to make fun stages that people will actually play and enjoy. So, like, I watched a few levels over the weekend and they were all quite short. Well, many of them were short but took a while to complete, so bonus points for making things difficult, but learnable. Has anyone else gotten the impression that the levels are on the shorter side or did I just happen to watch vids on the shorter end of the spectrum? Are you talking about pre-built levels or user-made ones or what? I don't actually know, one of the videos believed what they were playing were pre-built levels. Some of the others were fan made, which I expect to be shorter in general as they're not professionals. But I've also played a LOT of LBP levels that were significantly long. Oops, yeah, that's what happens when you're on your phone. Stupid app copies the youtu.be url. Come on app, know I want to post to GWJ! Looks like the NDA on reviews was just lifted as they're popping up all over the place. Yup, and they're very positive from what I've seen of the numbers. Not terribly surprising considering how much time reviewers has with the game (a sure sign lately about Nintendo's confidence in their titles). Well, thanks to the wonders of Amazon and a very generous gift from a friend, it looks like I'll be getting this day one. Look forward to some impressions on the 11th! Or, if I'm lucky and they do a midnight unlock on Eastern time, some impressions on the 10th. I'm not really bothered by this at all, the things that are missing is interesting. A number of them are probably due to complexity (slopes, rising/lowering water, vertical stages, snake blocks, etc. ), requiring mechanics exclusive to a game (Blaarg and Porcupuffer both can't be killed but in SMW you can spin jump off them), or would require significant art assets (missing tilesets). Also, it seems weird for there to be Mario 2/Mario USA things in the list since that's not a game they seem to be basing this toolkit on. It'd be cool if some of these were added in as DLC or free updates, but I'm not really holding my breath. Even with these items missing there's still a ton of things you can put in a stage. Yeah, the list of missing stuff is absurdly small considering how much is in there. So many of the things missing were rarely used. Slopes are potentially the biggest miss for me, but I can certainly live without desert levels! Crazy to see how much stuff that was left out actually came from SMW. Yeah, there's a lot "missing" that I'd enjoy playing around with, but the main thing that I will miss is the lack of vertical stages. Not a huge deal, but a mild disappointment. There's an amazing amount of content in Mario Maker as it is, though, and I am excited to see what more creative minds than me will be able churn out! Mario 3 is the runner up I think. But in both cases it speaks to the sheer volume of elements in those games. A number of the omissions were only used once or twice in their respective games. Guess I better order that increased capacity battery and get that WiiU pad screen protector installed. Given the large number of items they've back-ported to the older tile sets, I think they can be forgiven for the things they've left out. I notice the graphic doesn't mention the tiny mushroom, nor does it mention the blue shell suit from New Super Mario Bros. on the DS. Does that mean they're in Super Mario Maker, or does it mean the graphic creator forgot about them? On a related note, why has that blue shell not been in every other Mario game since its introduction? It's such an elegant powerup that fits in with the rest of the design perfectly. When you have it, when you get up to a full-speed run you go inside the shell and it careens forward as if it were one you kicked. It lets you move fast, jump a bit farther, kill enemies, and bust blocks horizontally, but you also can't slow down unless you stop completely and kill your momentum. Once you learned how to use it well it was some of the most fun you could have in a Mario game. And it was built entirely out of mechanics that have been around since the original. I'll be really interested to see what kinds of updates and DLC this game gets. I find it very difficult to imagine that they wouldn't add more content down the line, given how they've handled Smash Bros., Mario Kart 8, and Splatoon.